In consideration of the latest disaster to be visited upon the settlement known generally as Los Angeles, California, we look back at some of the best writing on the city’s propensity to catch fire. Driving over the pass at Beverly Glen, riding shotgun for a friend on the way to his wedding (gulp) in Encino, we suddenly find ourselves, along with several millions of other urban denizens otherwise going about their business this blistering Saturday afternoon, confronted with the spectacular roiling plume of the now-infamous Station Fire. 4,000+ homes and countless horses, pets and exotic animals have been evacuated. More than 60 homes have burned to their foundations. Vehicles have melted into their parking spots. 2 fire fighters are dead. The 74-year-old Vetter Fire Tower, where I once spent days above the smog, reading Kerouac’s Desolation Angels (of course), or chatting with veteran lookout Kermit Eller about his break-barrel Chinese Model 62 air rifle while surveying the advancing plague of ground squirrels, is gone. Station Fire stats, Sept. 5, ten days in: Total Personnel: 5,244. Size: 154,655 acres. Growth Potential: High. Terrain Difficulty: Extreme. Estimated Containment Date: Tuesday September 15th, 2009 approx 06:00 PM. It’s that time of the year again: wildfire season. Los Angeles is burning. Like in the Bad Religion song. Like it has most every year since the beginning. Like it probably will—with ever greater frequency as the planet gets hotter—until there’s nothing left to burn. Here’s a spectacular collection of images from the latest conflagration. Plus four more unreal timelapse videos. It often begins with the wind, as Chandler wrote in his novella “Red Wind” (1938), published in the collection Trouble is My Business, also available on audio, read by Elliot Gould. It was one of those hot dry Santa Anas that come down through the mountain passes and curl your hair and make your nerves jump and your skin itch. On nights like that every booze party ends in a fight. Meek little wives feel the edge of the carving knife and study their husbands’ necks. Anything can happen. You can even get a full glass of beer at a cocktail lounge. In her “Los Angeles Notebook,” published in Slouching Toward Bethlehem, Didion catalogs some of LA’s big mid-century fires: Malibu in ’56, Bel Air in ’61, Santa Barbara in ’64, Watts in ’65 (during the riots). She writes of how the San Gabriels went up in flames in November of ’57, and again during the winter of ’66-’67. Most years it is September or October before the Santa Ana winds start blowing down through the passes and the relative humidity drops to figures like 7 or 6 or 3 percent and the bougainvillea starts rattling in the driveway and people start watching the horizon for smoke and tuning in to another of those extreme local possibilities, in this case that of immanent devastation. When the fire comes there will be no water pressure. The roof one watered all the night before will go dry in seconds. Plastic trash cans must be filled with water and wet gunny-sacks kept at hand, for smothering the sparks that blow ahead of the fire. The garden hoses must be connected and left where they can be seen. The cars must be placed in the garage, headed out. Whatever one wants to save must be placed in the cars. The lights must be left on, so that the house can be seen in the smoke. In his emblematic early-LA novel Day of the Locust (1939), a sensitive young painter by the name of Tod Hockett comes to Hollywood, fresh from Yale, for an easy-money gig in set and costume design. Watch John Schlesinger’s way-over-the-top interpretation here, from 1975, starring Donald Sutherland and Burgess Meredith. burst out at any time. High or low—hard, soft, or mixed—all chaparral has in common an always developing, relentlessly intensifying, vital necessity to burst into flame. In a sense, chaparral consumes fire no less than fire consumes chaparral. Fire nourishes and rejuvenates the plants. There are seeds that fall into the soil, stay there indefinitely, and will not germinate except in the aftermath of fire. There are basal buds that sprout only after fire. Droughts are so long, rains so brief, that dead bits of wood and leaves scarcely decay. Instead, they accumulate, thicken, until the plant community is all but strangling in its own duff. The nutrients in the dead material are being withheld from the soil. When fire comes, it puts the nutrients back in the ground. Hundreds of acres can be burned clean in minutes. In thick black smoke there is wild orange flame, rising through the canyons like explosion crowns. The canyons serve as chimneys, and in minutes whole mountains are aflame, resembling volcanoes, emitting high columns of fire and smoke. The smoke can rise twenty thousand feet. A force of two thousand people may fight the fire, plus dozens of machines, including squadrons in the air. 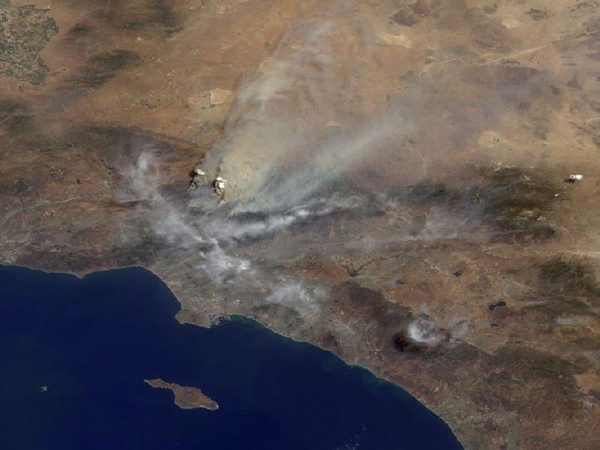 But Santa Ana firestorms are so violent that they are really beyond all effort at control. From the edge of the city upward, sixteen miles of mountain front have burned to the ridgeline in a single day. One of the most thorough (and polemical) treatments of the relationship between fire and the city comes in Ecology of Fear: Los Angeles and the Imagination of Disaster (1998). Davis traces the ancient Tong Va practice of intentional seasonal burning—now considered by most experts to be the most effective way to mitigate the potentially disastrous effects of wildland fire—to a situation today in which such an approach proves impossible. Local fire agencies are hamstrung by the potential liability, while homeowners associations throughout the firebelt finger the trigger of litigation. Once again, politicians and the media have allowed the essential landuse issue—the rampant, uncontrolled proliferation of firebelt suburbs—to be camouflaged in a neutral discourse about natural hazards and public safety. But ‘safety’ for the Malibu and Laguna coasts as well as hundreds of other luxury enclaves and gated hilltop suburbs is becoming one of the state’s major social expenditures, although—unlike welfare or immigration—it is almost never debated in terms of trade-offs or alternatives. The $100 million cost of mobilizing 15,000 firefighters during Halloween week 1993 may be an increasingly common entry in the public ledger. Needless to say, there is no comparable investment in the fire, toxic, or earthquake safety of inner-city communities. Instead, as in so many things, we tolerate two systems of hazard prevention, separate and unequal. The battle against the Station Fire alone has, as of this writing, cost upwards of $80 million. In a state that is now famously on the threshold of complete financial collapse. And so it goes: the fires burn on. The city edges back a bit to watch the spectacle. Then one day, perhaps, the rain will come, and the debris slides. Seeds will germinate. Across the slopes and in the canyons will spring new manzanita and chamisa, buckwheat, burroweed and Scotch broom. Wild mustard will grow taller than a man, dry up in the wind and then burn again.